"There is nothing more beautiful than the fortress on the Moselle which fortifies the French borders, and which will ensure that the Electors of Cologne, Trier, Mainz and the Palatinate will continue to be so dependent that this border will, in future, be better and more easily defendable than the border to Flandres," wrote Loivois, War Minister to the Sun King full of enthusiasm in a letter dated 18th May, 1687 after his first inspectionof the future locationof the Mont Royal fortress. Mont Royal belonged to the northern cordonof fortresses which safeguardedthe French border from theEnglish Channel through to Luxembourg, Strasbourg and Basel at the end of the 17th century. For a decade, it fullfilled its function as an indispensable basis of operation for the Rhine army of King Louis XIV. These mighty fortifications enclosed not only the entire area of the peninsular mountain of Traben, but also surrounded the walled city of Trarbach and, on the other side of the river, Grevenburg Castle which had been fortified by Vauban. 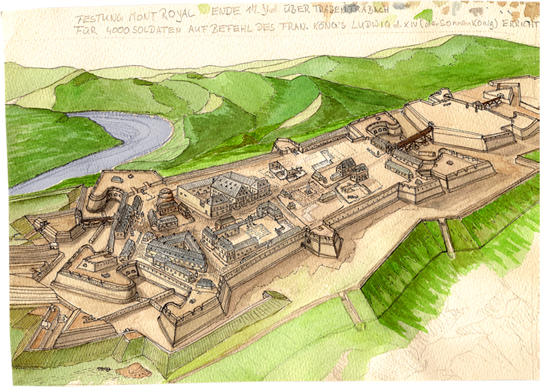 The main fortress covered 50 hectares (about 123 acres) of land situated approximately 200 meteres (about 650 feet) above the Moselle river and was enclosed by the main ramparts which were up to 30 metres (nearly 100 feet) high and 3 kilometres (nearly 2 miles) in lenght. It was reinforced by 5 bastions and three fortified towers and protected by numerous outworks. South of the fortress , was the Grand Royal Headquaters, an entrenched camp with barracks for 12,000 men and stables for 3,000 horses, a mercantile settlement and a small town with its own court of law. By 1690, the fortress garrison included 14regiments and its armoury and depots housed ammunition and supplies for a complete army, making it twice as stong as the smaller fortresses of Saarlous and Luxembourg. Hence, Mont Royal was not only the largest stronghold of its time, but was also one of the 9 fortified „new towns“ which were designed and built from nothing in the periode between 1679 and 1698, according to plans drafted by the great architect Vauban. According to the church records of Mont Royalwhich have been preserved until today, an independent, multicultural community developedon the mountain, although the lifetime of thisfortress citywas notably short. The fate of Mont Royal was directly linkedto the military conflicts which took place during the war of Palatine Successionand to King Loui's visionof establishing a continuous, natural line of demarcationto the east of his kingdom. The ceding of the „reunited“ territories brought this dream to an abrupt end. After the Peace of Ryswick, King Lois XIV ordered the fortress to be demolished in the spring of 1698. Thanks to Dr. Ernst Willen Spies, a specialised local historian, the Mont Royal fortress has not completely faded into obscurity. Between 1929 and 1938, he supervisedcomprehensive excavations based on the original plans foundin military archives in Paris. However, the ruins which, during the 1930s had impressively bome witness to the former greatness of this fortress were subsequently abandoned to further decay for many years. Flourishing vegetation encroached on the stonework and, coupled with erosion, threatened to destroy it completely. Due to a newly awakened interest in maintaining and restoring catles and fortresses as witnesses to an eventful history and as evidence to European cultural heritage, Mont Royal, too, has now become a noteworthy tourist attraction on the banks of the Moselle river.